Wow! It’s been just about a year since we have posted anything on here. Not to make excuses, but 2014 was a whirlwind of a year. Here’s a photo diary of some of the hightlights. Our barn roof and service room got re-done after our little mishap last winter. The unfortunate end of our old “stock trailer”. Thankfully our two new rams were just fine. Everybody was excited for a new stock trailer with four walls and a roof! 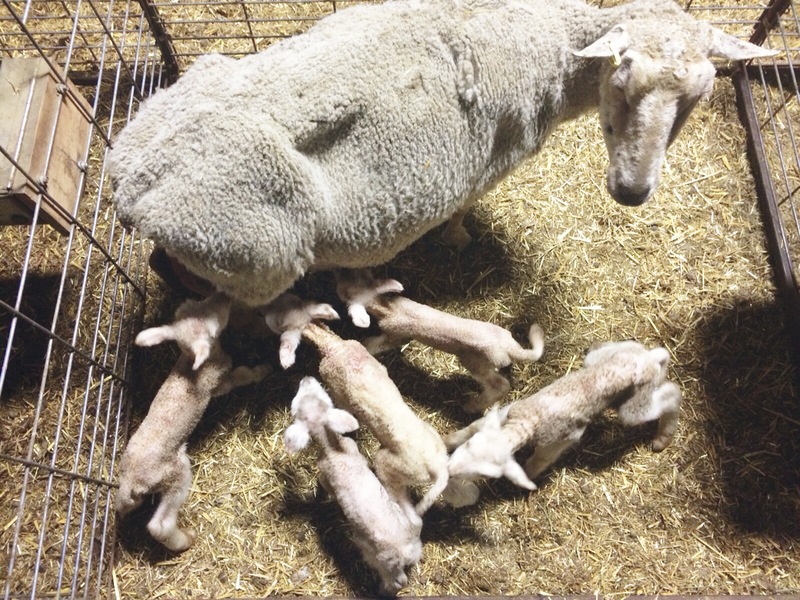 Not too unusual, but still a really nice set of quintuplet lambs. This is one of the proto-types for our self-weaning creep gate. The final version is working fairly well for us now. 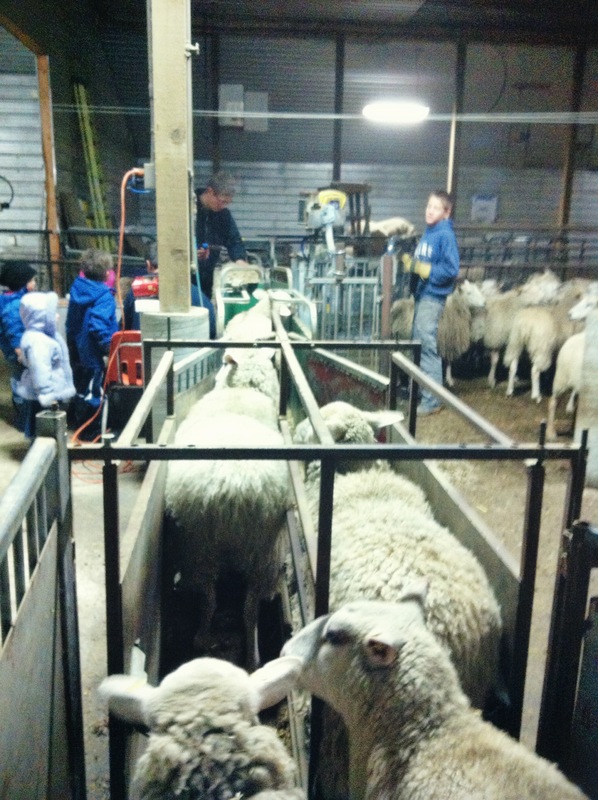 80 of our lambs participated in a special research project at Olds College. 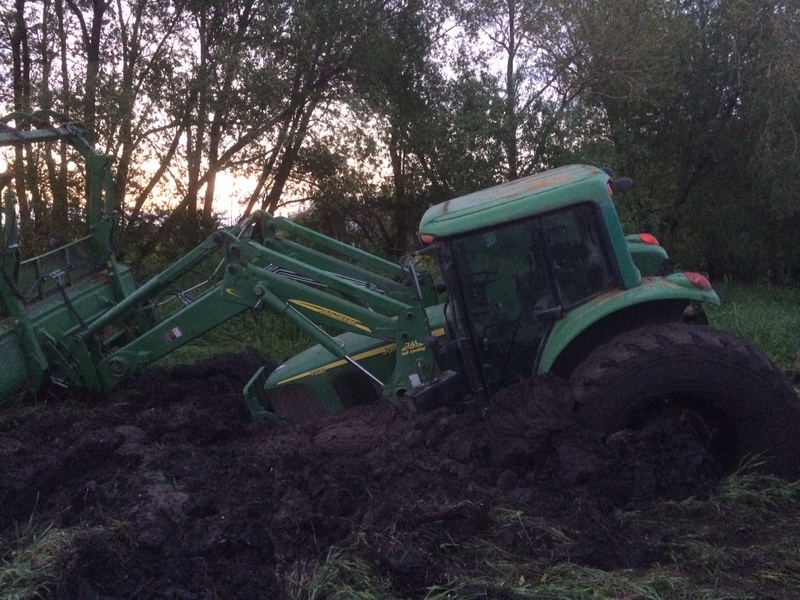 It was a very, very wet summer. Found this sink-hole by accident one day. 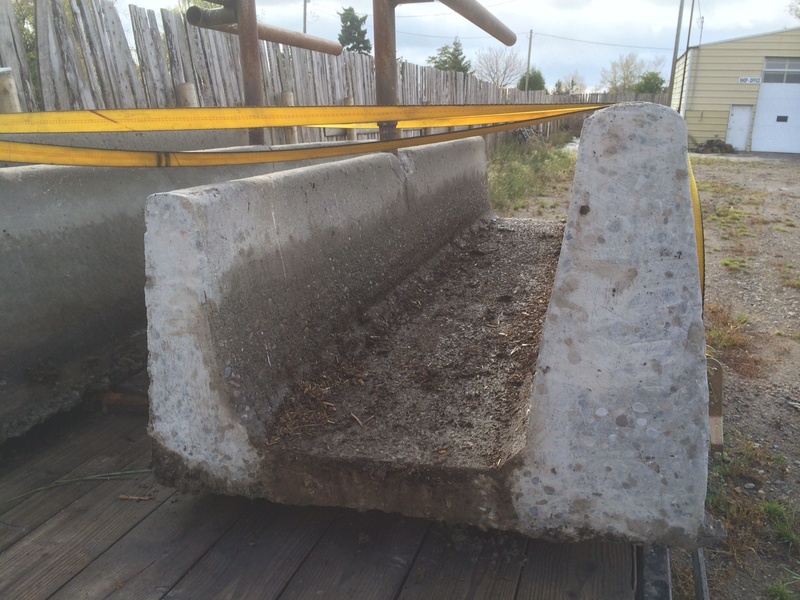 Spent a lot of time this summer cutting up concrete cattle feed bunks to haul home and convert over to sheep. It probably ended up being more work than it was worth but they’ll make some really nice sheep feed bunks. 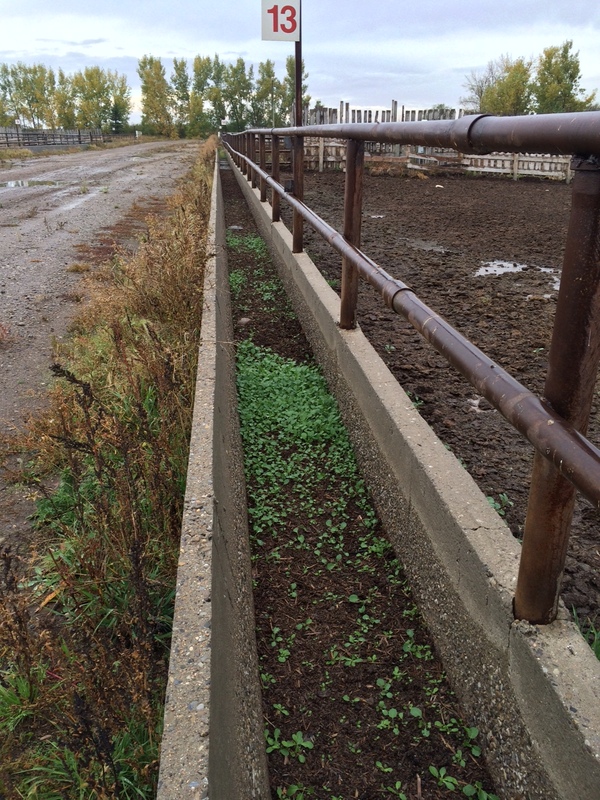 It was an excellent summer for pasture this year. 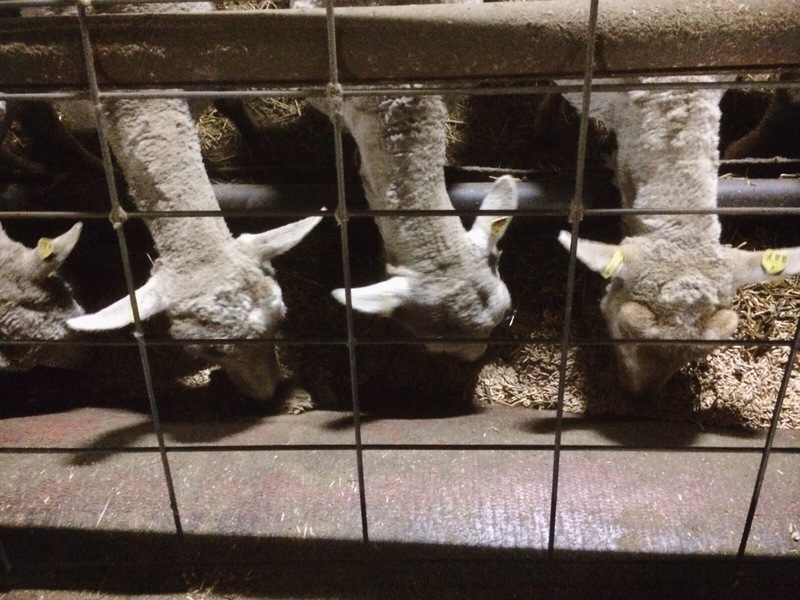 We were able to keep the ewes out at pasture much longer than most years before we brought them back to our farm. 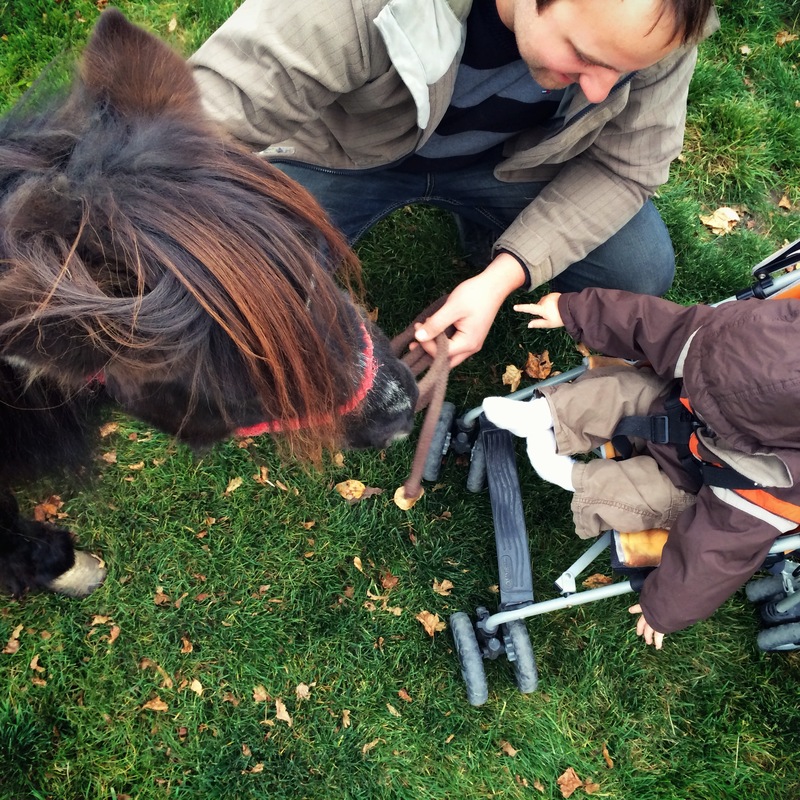 We are now the proud owners of a cute little miniature horse. We decided to sell our full size horse, Kenya, this year because she just wasn’t getting the attention she needed and then we were thrilled to find out that our neighbor was selling a miniature horse. For this stage in our lives, with so many young children, we figured this would be a much better fit for our family. 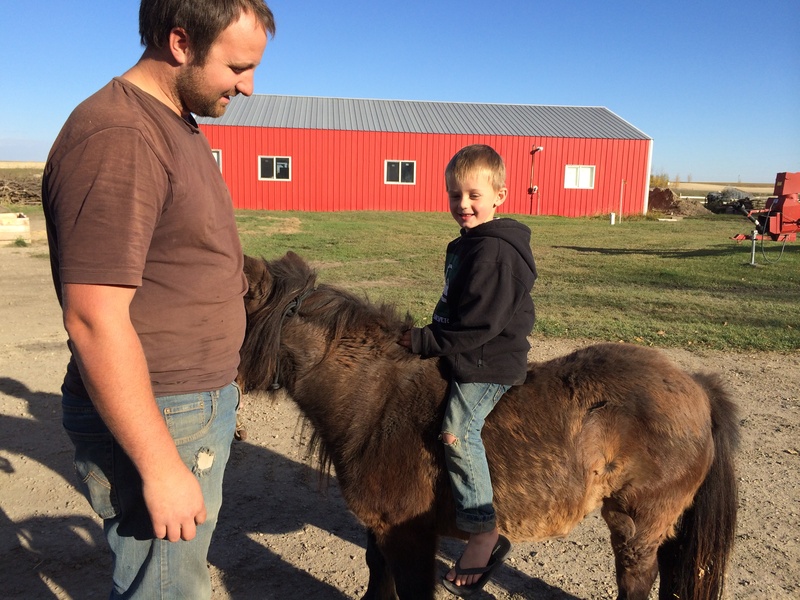 Our youngest, Henry, and Miles enjoying the new horse. 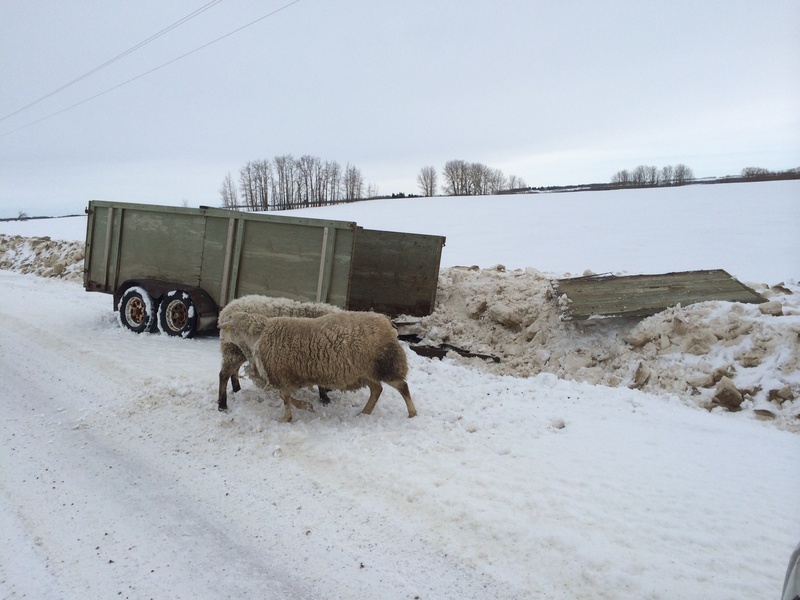 Bringing the ewes back from pasture before the snow came. 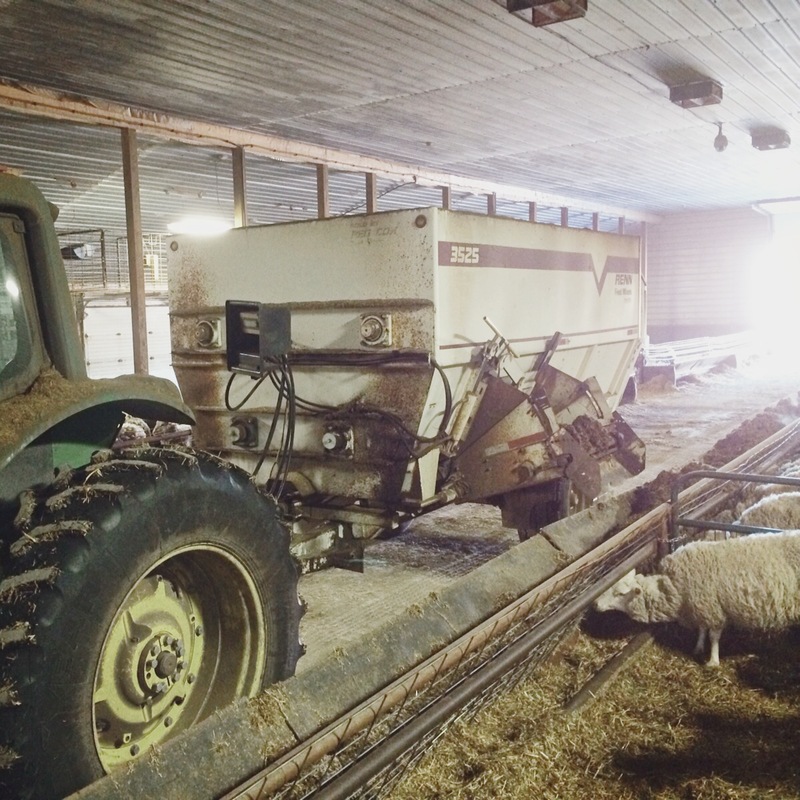 We found a good used feed wagon so now we can mix TMR feed for the sheep. This allowed us to make the switch to silage feeding this year. We’re excited to announce that we will be launching our very own line of ALYSHEEP wool products. 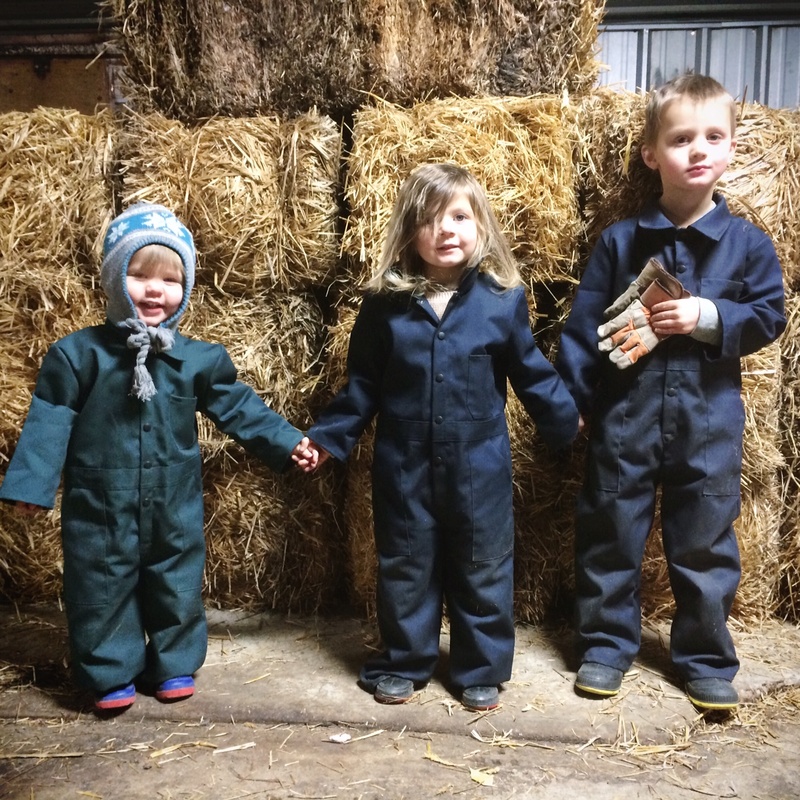 The last couple of months last year were filled with planning out this new aspect of our farm. 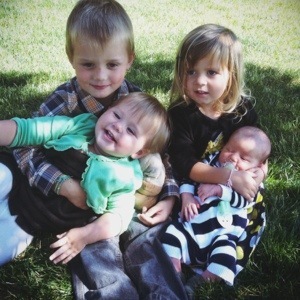 All four of our kids grew so much this year and we are so thankful and blessed for the many hours we had to enjoy playing with, working alongside and teaching these four little munchkins. Our oldest, Timothy, started kindergarten this year so we’ve enjoyed our time teaching him to read, write and do some basic math at home. Home schooling has some challenges but it also has many many benefits! We look forward to another great year this year! Yikes, where did January go? I had intended on making a few more posts before lambing. I wanted to write a little bit about some of the unique things we’re trying out this year. Instead, what we’ll have to do is make a few posts as lambing goes along. January started off with a bang… literally. Our barn was one of the many in this area that had it’s roof collapse. Thankfully the main part of the barn was unaffected. Only the service room on the south end was damaged. Still, it set us back quite a bit in our preparations for lambing. We were extremely blessed to have lots of help getting things cleaned up and keeping the farm running at the same time. A huge thank you to all of our family, as well as the Pearson boys, who came to help out. All the wreckage is cleaned up and utilities are connected so that the barn functions as normally as possible. 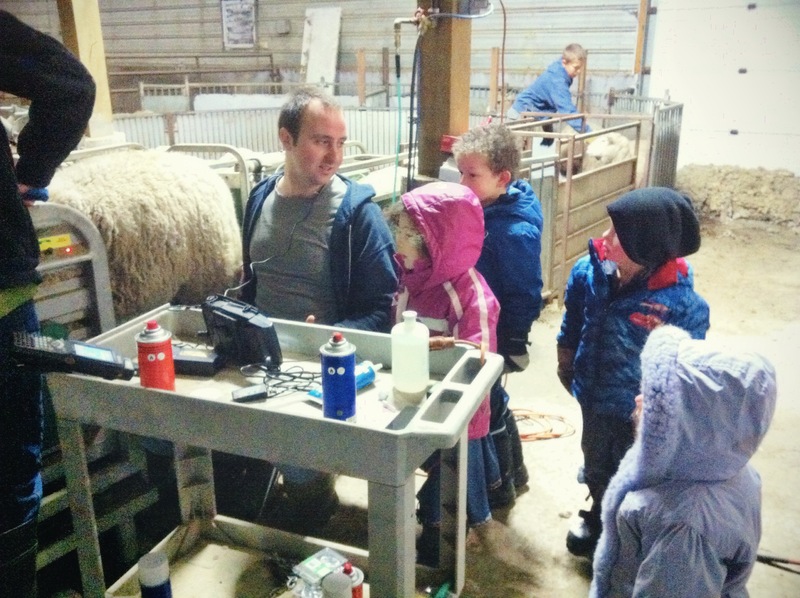 In the end, we were able to get everything set up in the barn, and lambing started pretty much right on schedule. Our first lamb of the year! As of right now, we have about 85 ewes done lambing and things are going quite well. This is one of the first times that I have managed this many ewes lambing at once. 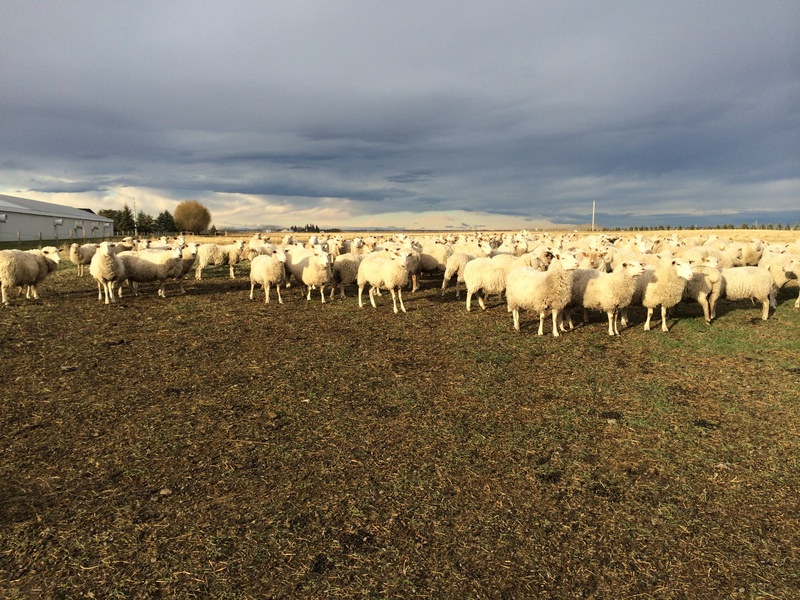 We have nearly 400 ewes in this group. We have done groups this size in the past, but we always had at least one person hired to help out. So far, this year we are keeping up, and I have to attribute it to how much Alyssa has been able to help out. She has been coming out about twice a day with the kids and helping with getting jugs watered and grain fed. Timmy is really keen on learning the ropes and really enjoys using the garden hose to water jugs. 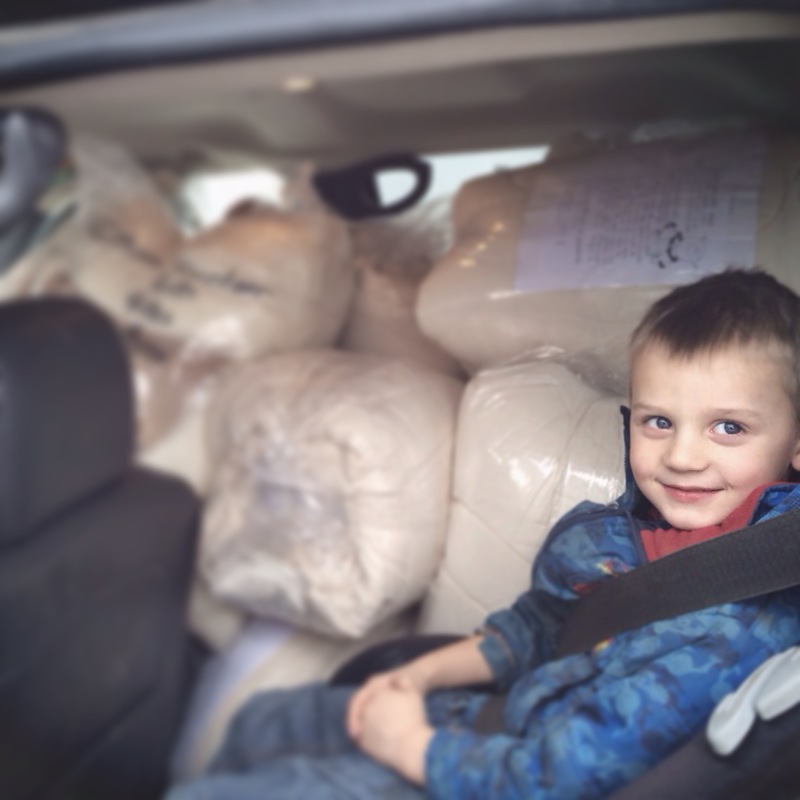 All the kids enjoy coming to the barn, even Henry who likes to sleep in his car seat. 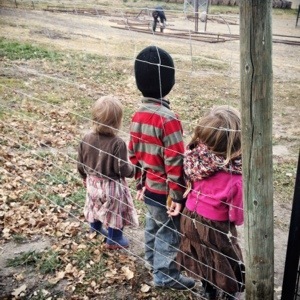 Getting the orphan barn ready. 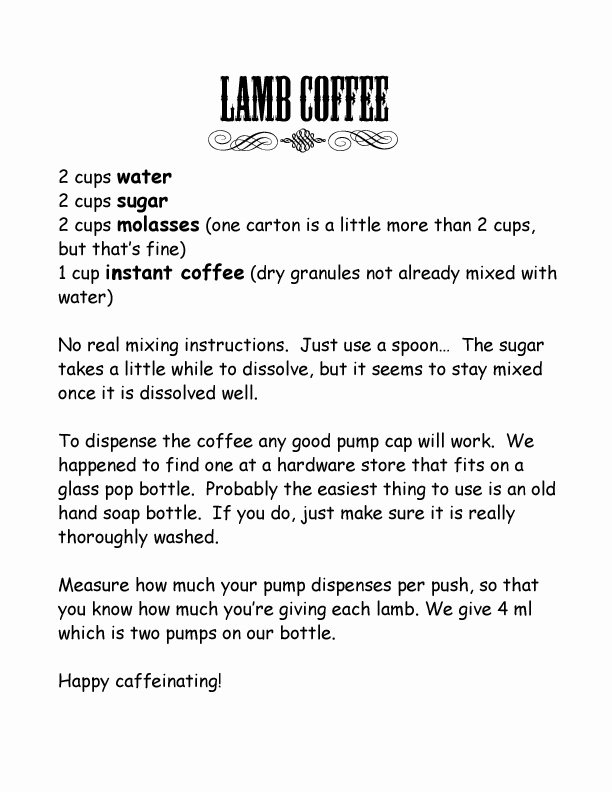 We have a few new things that we’re trying out this lambing season and we’re going to try to share those with you as things progress. I was blessed to spend a little time in the barn this morning doing the feedings. Come Christmas time, I am always reminded of the manner in which our Savior entered the world. So often, we forget to even consider the birth of Jesus this time of year. In our best moments, we think about the baby wrapped up in swaddling clothes lying in a manger, but as I look at the nativity sets all around, I think that we have missed something of the reality of what Christ came into. As I hurried my way through the barn this morning, hundreds of noisy ewes bellowed at me in their greedy quest to fill their stomachs. 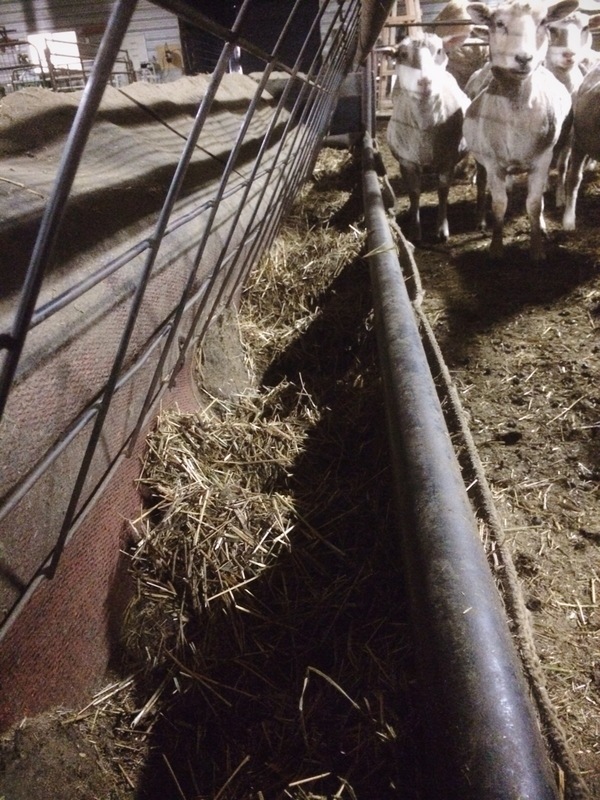 They jostled and pushed their way through the straw and manure to find a place at the feed bunk. I’ve always been quite happy with our feed bunks as far as feeding sheep goes, but Christmas morning the feed bunks take on a new appearance. They look dirtier and dustier, the bottoms are caked with old bits of feed and manure and dozens of drooly sheep mouths plunge into the barley that I’m busy pouring. This is a stark truth when you are nose to nose with a two hundred pound panting drooling old ewe looking into her feed trough. THIS is it! This is where the newborn baby Jesus was laid those many years ago. This was his bassinet. 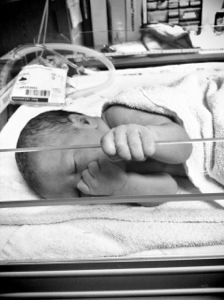 A fresh understanding of what it means that the Creator of the Universe stepped down into the form of a helpless baby to be born like any one of us. The perfect God surrounded by the filth of a creation so utterly ruined by the sin of each one of us. One has to ask the question why? Why would he do that? It’s simple really. It’s because he loves you! It was all part of his masterful plan to redeem a world lost and without hope. His plan to take our sin upon himself that each of us might have the opportunity to trust him and be saved from the consequences of our own sin! What amazing love, what amazing grace! And it started here, in a feed bunk. 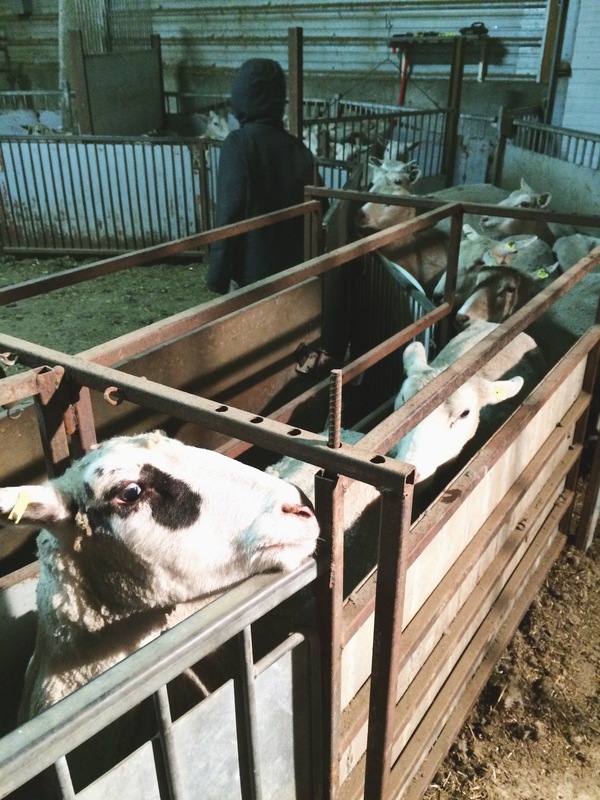 Counting Lambs Before They’re… Hatched? Well, it’s now confirmed that about 400 ewes will be lambing here through February and March. 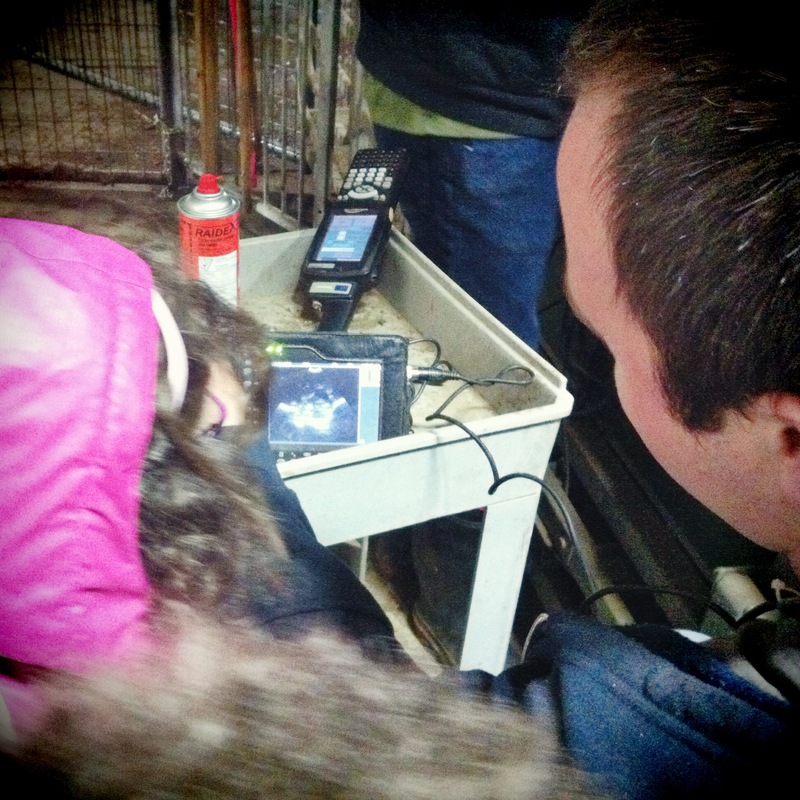 Yesterday was a full day of running our first breeding group through for ultrasound preg-checking. 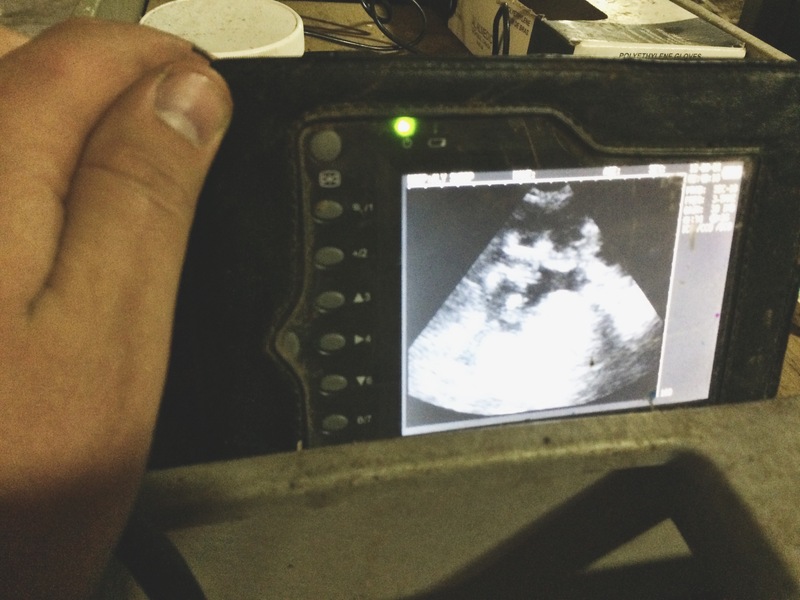 We’ve been ultrasounding our own ewes now for a number of years and, though it is a big job, we find that it really pays off pretty quickly. 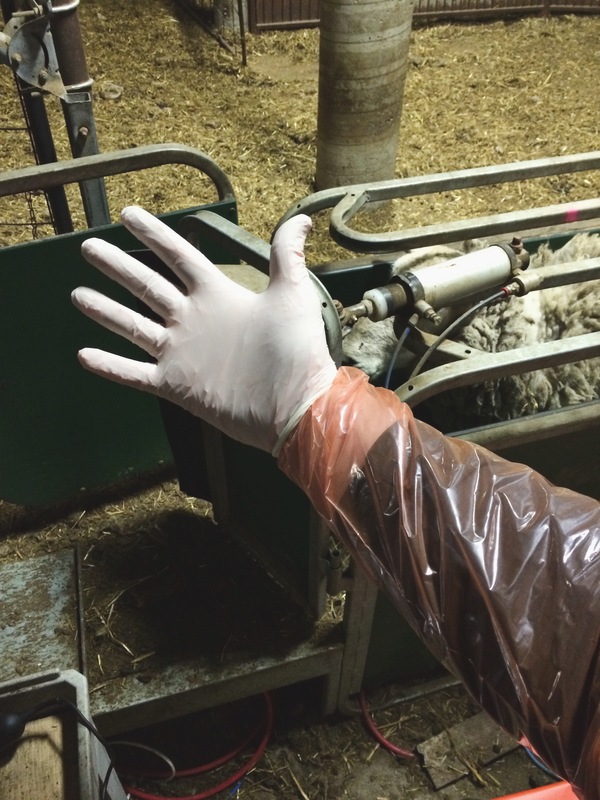 It allows us to identify our open ewes and, either give them another chance to breed, or identify cull ewes sooner than otherwise. 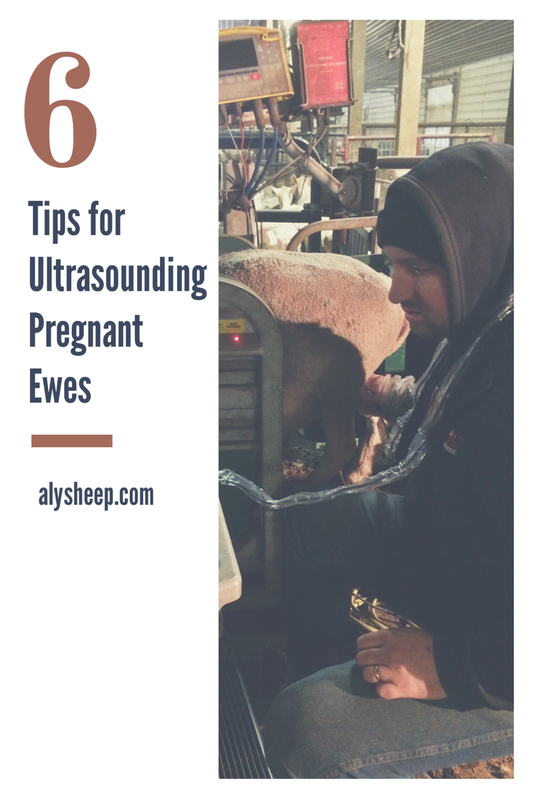 It also means that we aren’t feeding several open ewes all the way through late gestation and lambing rations, which is costly enough for pregnant ewes. 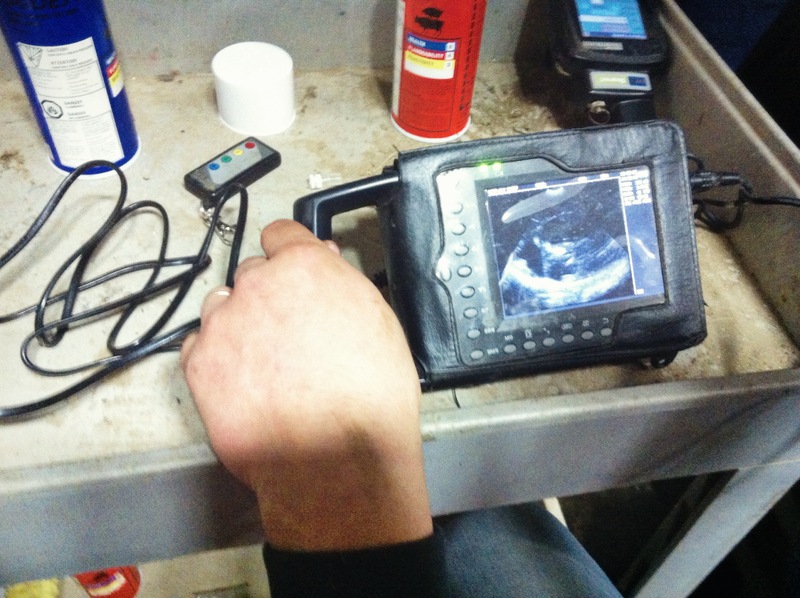 We have been using a small portable ultrasound unit from Intriquip. It’s about the perfect balance between cost and performance for our operation. 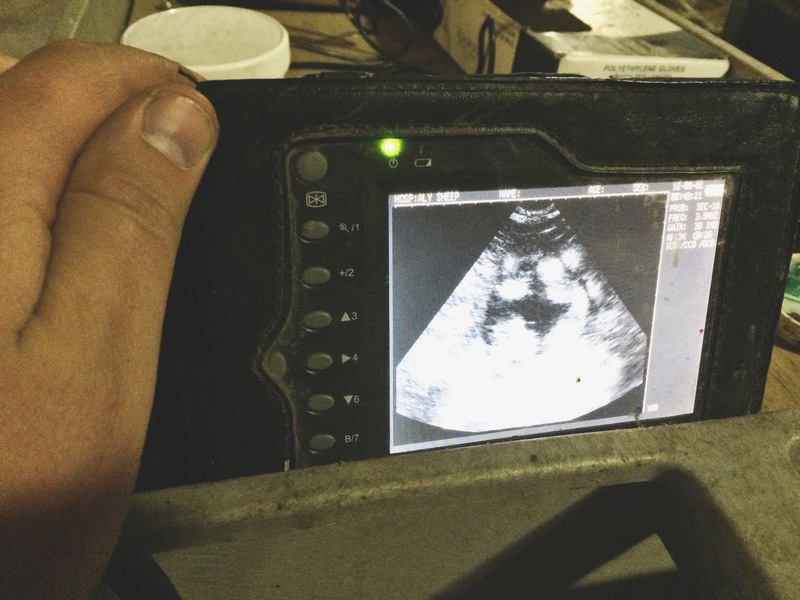 We use it simply to identify open and pregnant ewes. 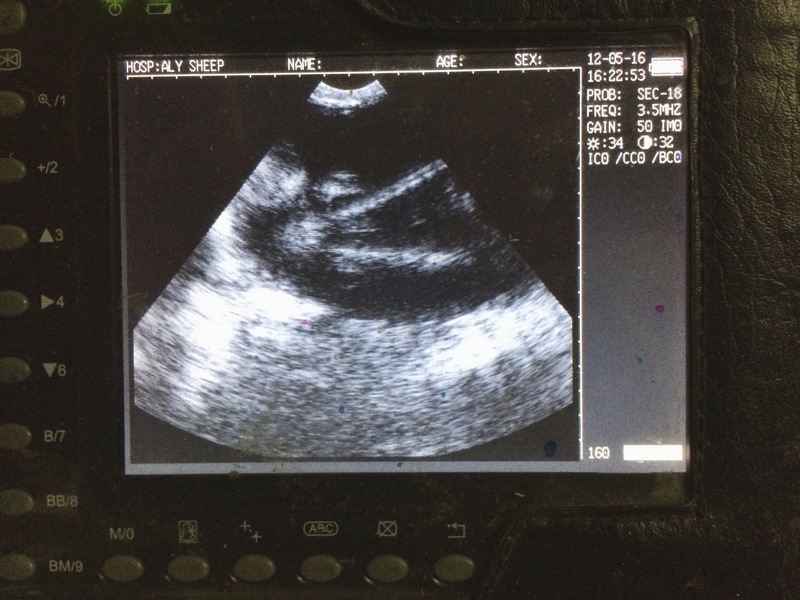 As much as I would like to be able to count the number of lambs per ewe, it would require much more experience and training on my part and probably a more expensive ultrasound unit. We were thankful to have Connor and Brayden Pearson join us for the day. Once again they blew me away with their industriousness, and we managed to get through the whole group of a little over 400 ewes. Overall everything went very smoothly. 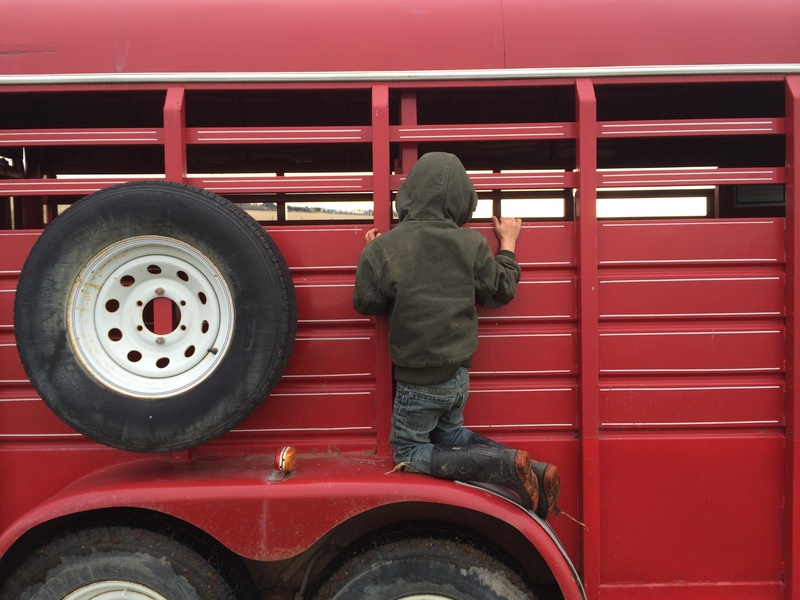 Brayden got to put our new alley system to the test while he ran the ewes up to us. 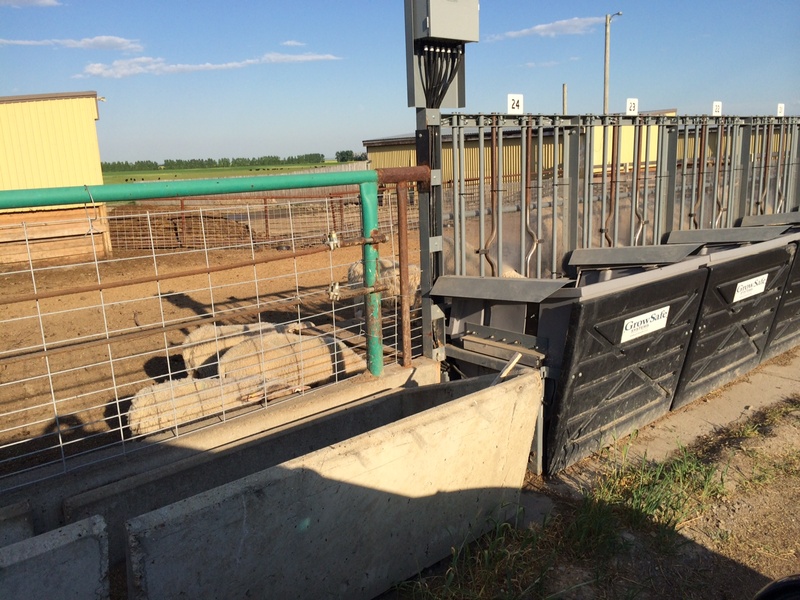 The night before last, I finished building and installing two guillotine gates in our curved lead up alley. The idea was to be able to keep small groups of ewes moving up the alley in a way that they could always see sheep ahead of them. To accomplish that, I used some pieces of overhead door panel for the bottom portion of the gates. They are nice and light weight and don’t have spaces where sheep can stick a leg through and get injured. The top portion of the gates is a panel made of galvanized steel rods. 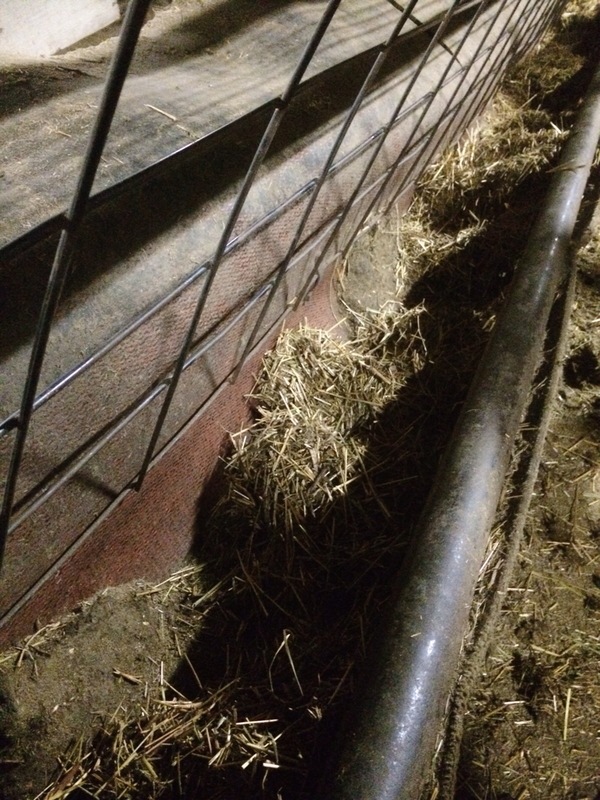 The sheep can see through this part of the panel to the next pen ahead of them. Sheep love to follow other sheep and it helps them move up the alley when they feel they are following rather than leading. I ran cables up through a pulley and across the handling pen then through another pulley and across over top of the squeeze. The plan was that the gates could be raised from either position. 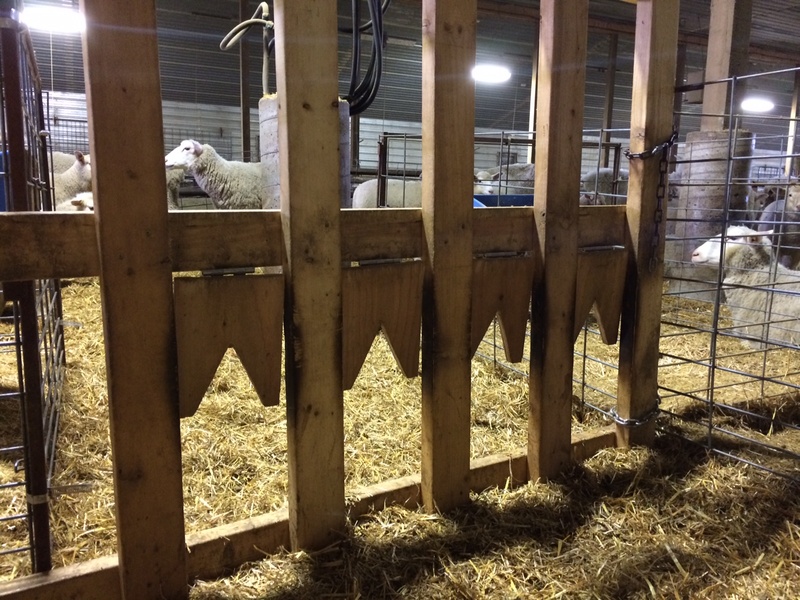 It seems like the design worked, because Brayden didn’t seem to have much trouble keeping us supplied with ewes nonstop all day! I’m thinking that the only change I will make is to add a counterweight to the lift cable so that the gates can be lifted a little bit more easily and quickly, but so far so good! 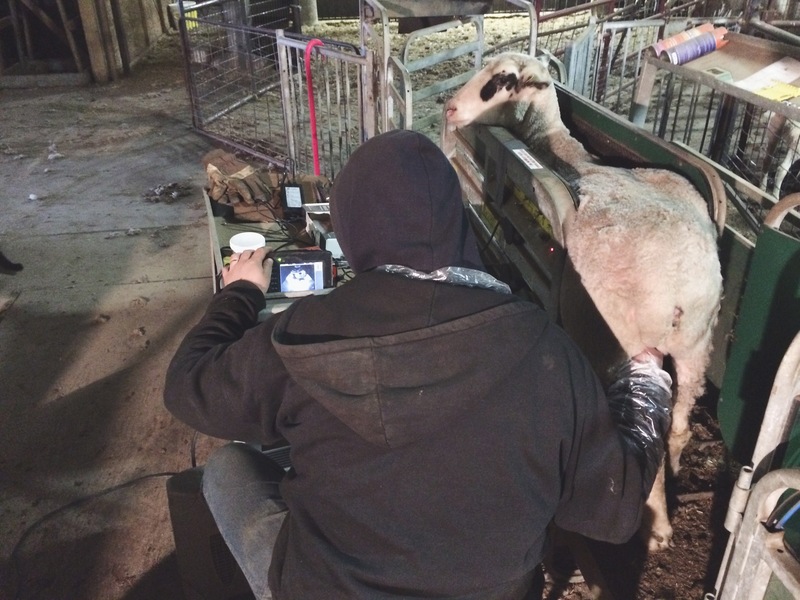 Meanwhile on the front end I was doing the ultrasound scanning while Connor recorded tag numbers and pregnancy status in the handheld. 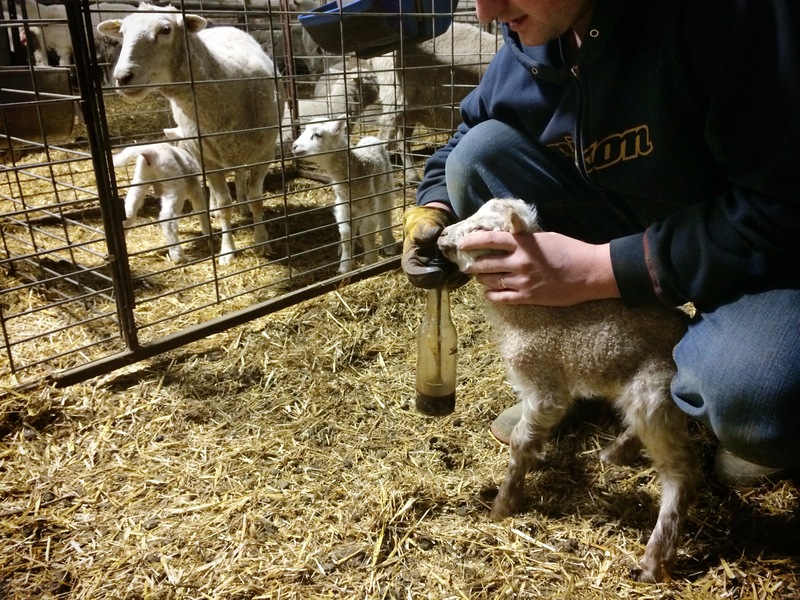 We also decided to give these ewes their dewormer while we were handling them, and Connor took care of that while I was busy scanning. This is one job where I am extremely thankful for our Racewell Superhandler squeeze. 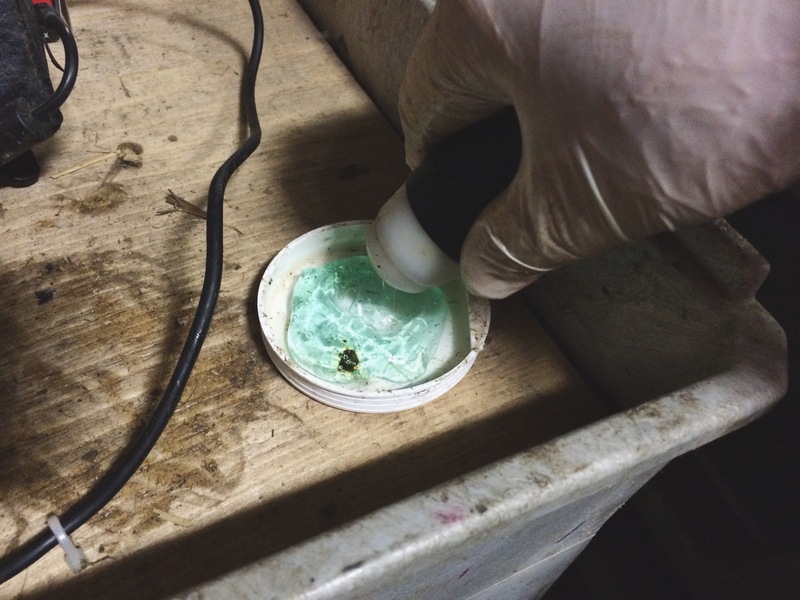 It works perfectly for ultrasounding. What I do, is set the ‘eyes’ to catch the ewes early so their back end is hanging out of the squeeze nicely. This gives me good access for scanning while keeping them restrained. It is also very nice to have the ewes up off the ground so I can sit in a chair rather than squatting all day. 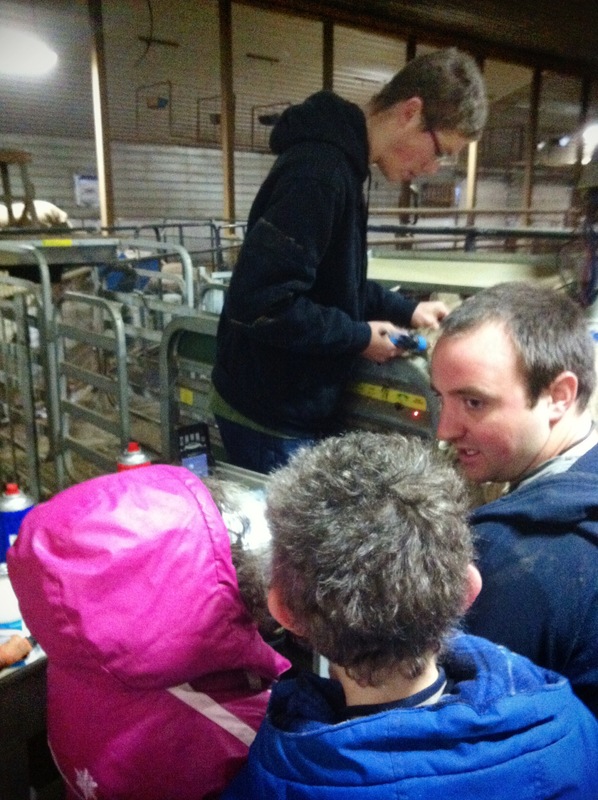 Ultrasounding ewes is done externally between the left hind leg and the udder. 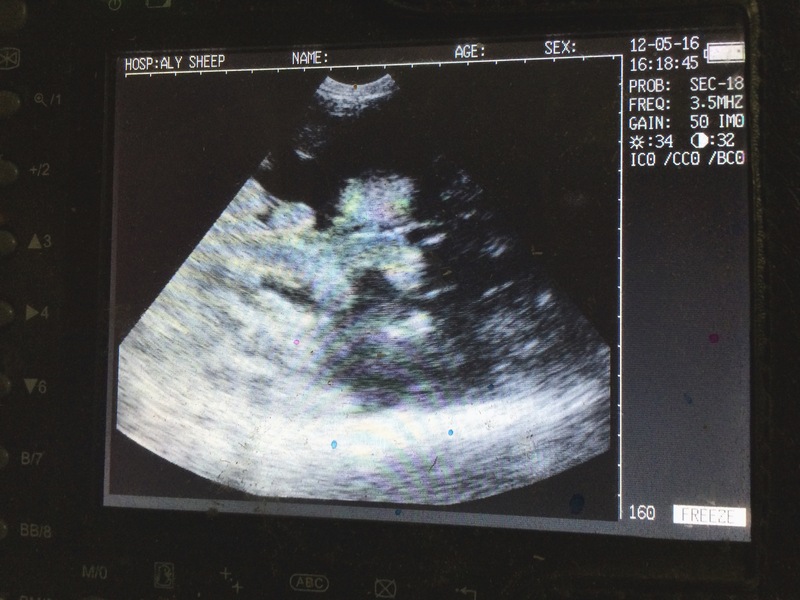 With a bit of practice most pregnant ewes are fairly quickly identified and the process moves along nicely. 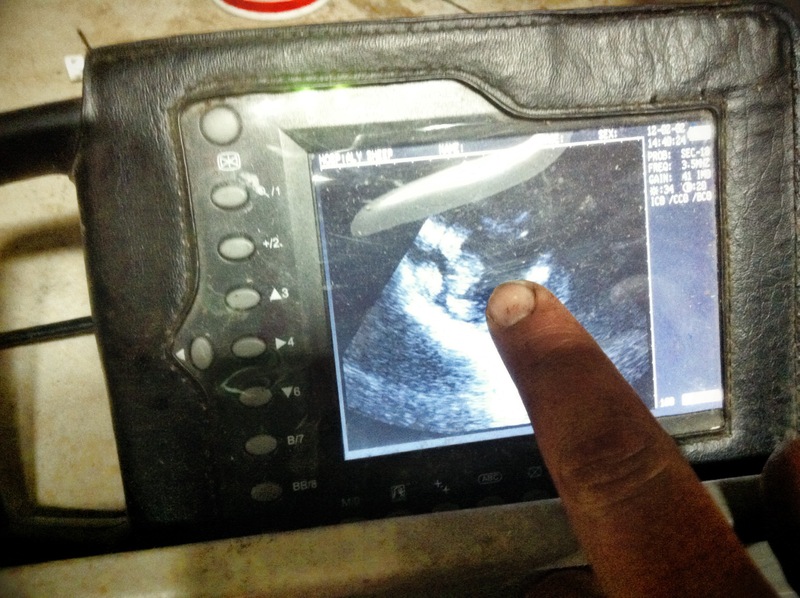 Some ewes seem to require a little more probing around to determine. The ones that I find most difficult are the open ewes. Probably because it’s a difficult search when you’re looking for something that’s not there. I usually spend a fair bit longer on ewes where nothing is immediately visible. Sometimes it turns out that she is pregnant, sometimes my searching yields no results. In that case she gets a pink mark and goes into a separate pen. In our flock, I will wait a few days and re-scan the ‘open’ group of ewes just to make sure that they are all actually open. At that point I can make a culling decision. If a ewe is one of our lower producers and is now open, then it’s a good opportunity to ship her. If she’s normally a good ewe and just didn’t take for some reason, then she will go in with the next breeding group and get another chance in a month or so. 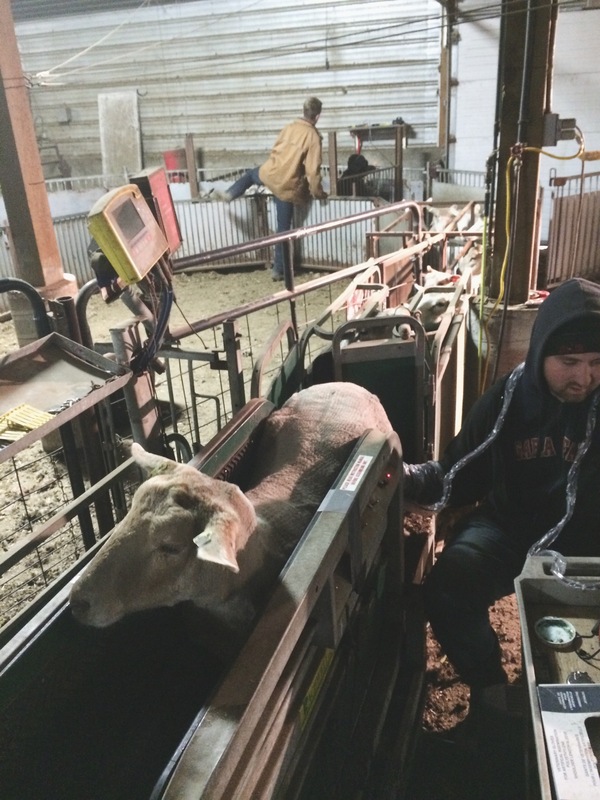 Ultrasounding sheep isn’t all that common in Alberta yet. Likely because the vet association won’t allow technicians to offer the service, as it is technically a veterinary diagnosis. 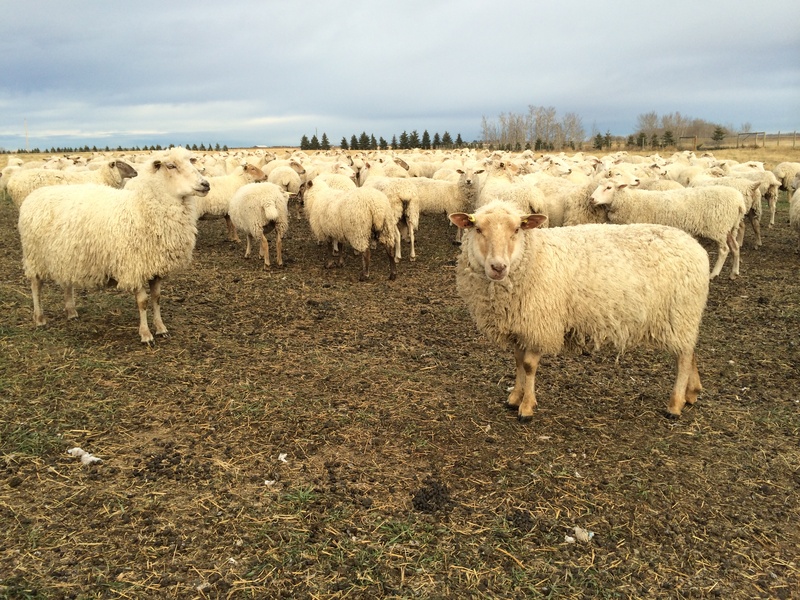 If you are a mid to large sized flock owner it might be something that you want to look in to. 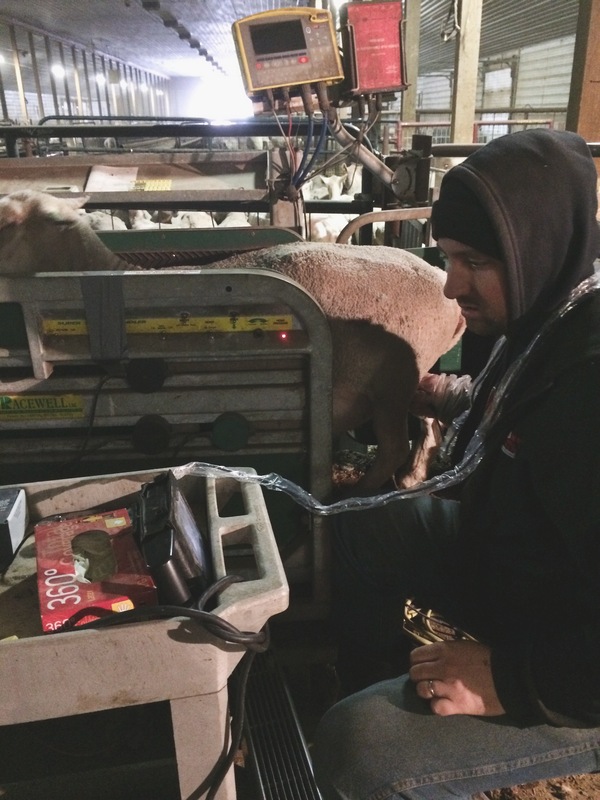 The cost of the equipment probably doesn’t make sense for anyone with a smaller flock, though several small producers might want to have joint ownership in a unit or some such arrangement. 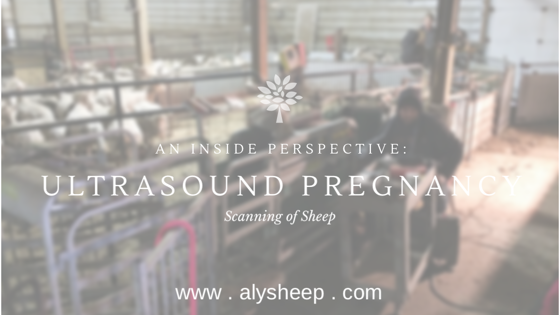 If you are interested in learning more about ultrasound scanning sheep let me know and I can try to answer any other questions that you might have. 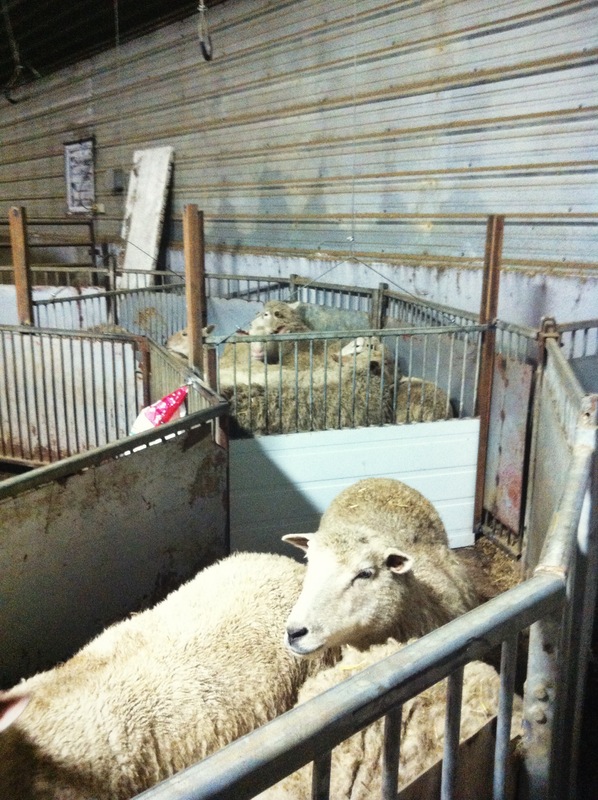 Next on the road to lambing will be shearing. Stay tuned. 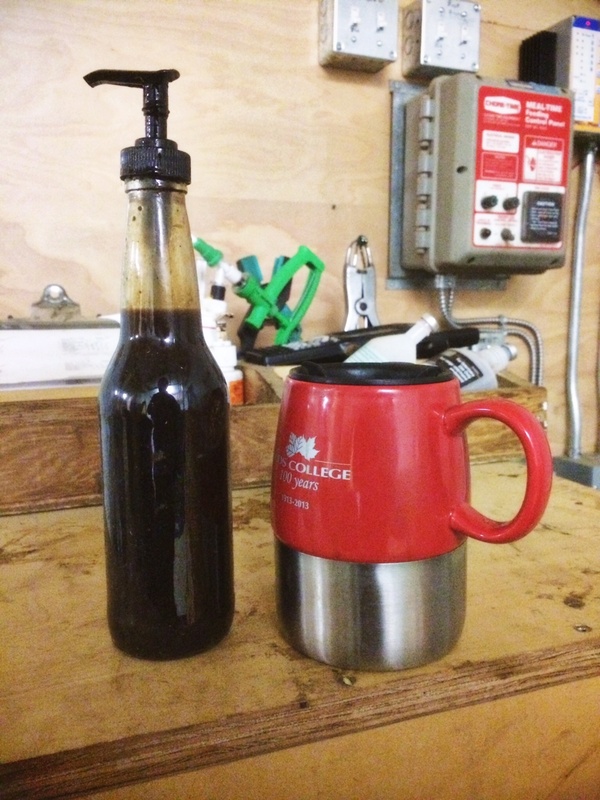 I’ve been puzzling over how I can recap the last two and a half months in a single blog post? How about one word?… BUSY! The busyness started August 29… well, late on August 28th actually. 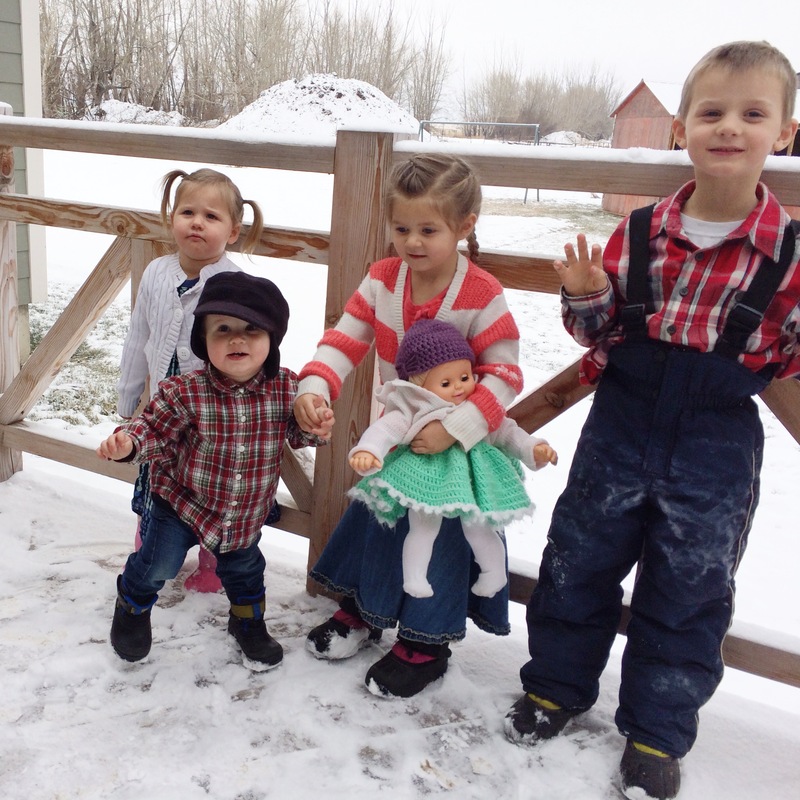 It started with hurriedly packing three sleepy older siblings into a minivan to spend the night at Oma and Opa’s while we headed off in the farm truck to the hospital. We’re thankful for the safe arrival of our fourth child Henry John Driedger! 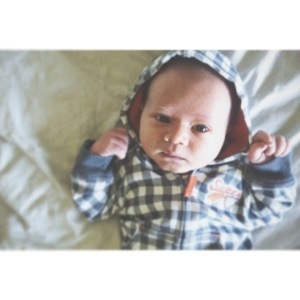 Born 1:45am August 29. Needless to say that kick started a very busy stretch for our family. It took a little while to adjust to four aged 3 and under. Of course we didn’t have to worry about that for long because as of September 25 we now have four aged 4 and under. And as much as that may make us sound busy, not more than two days ago I sold a few rams to a family expecting their sixth in 6 years! That made me thankful for our relatively quiet little family. 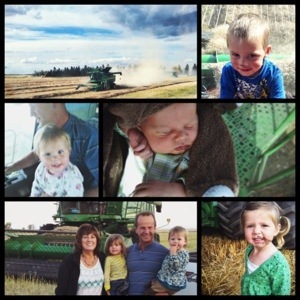 Well, as expected, harvest with Alyssa’s family got underway when Henry was about 1 week old. 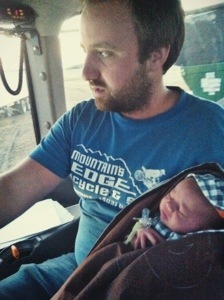 A little young to break him in to the combine, but he seemed to enjoy the endless bouncing and rumbling when he’d come along for rides. Everybody got their turns riding along with the different family members. 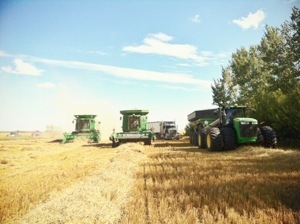 I spent most of my time running the grain cart back and forth between combines and the truck. It was a new experience and I sure enjoyed it! We wrapped up our stint in the field with a little bit of straw baling which is always enjoyable with a couple little riders. However, it sure was nice to have that wrapped up and get on to fall work as fast as possible before the snow hit. Fall work has been a bit of a blur as we tried to get as many outside jobs off the list as we could. Thanks to Alyssa’s dad for a big cleanup blitz around the yard as well as ‘clean-out’ inside the barn. We got the last few hay bales stacked into the hay shed and hauled the straw bales home thanks to our old neighbor’s home-made-self-unloading-bale-wagon. All this along with a number of other jobs and we were almost ready for the snow to fall. The last thing we needed to do was tear out a section of page wire and build some fenceline feeding for the extra 200 ewe lambs we’re feeding this winter. 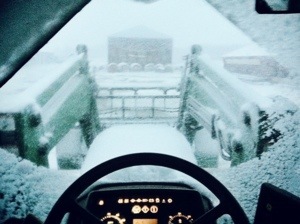 We were almost ready to get started when we heard the forecast for 20cm of snow over the weekend. I finished pulling out the old fence just as the snow began to fall, so after a quick lunch we bundled everyone up to join me outside. 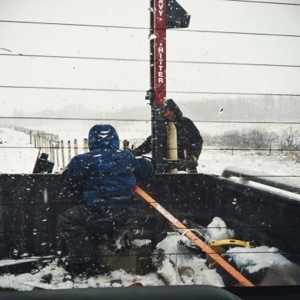 We hooked up the post pounder to the farm truck and buckled the youngest three in. Alyssa drove the truck along for me while Timmy watched from the truck box. It was slow going and the truck kept wanting to slide down the slope in all that fresh wet snow. The snow kept piling up around us and we had made it almost half way when it didn’t seem like the truck would make it much farther (it’s time for new tires). 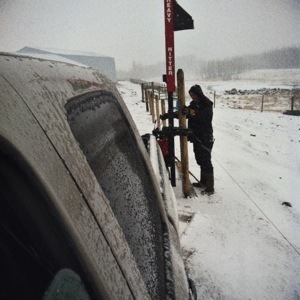 So everyone headed inside while I switched the post pounder over to the tractor. Alyssa’s brother, Andrew, was able to come drive the tractor for me and we just managed to get the last post in before sundown. The next day and a half were spent fastening up boards in the snow, which the whole family lent a hand with. 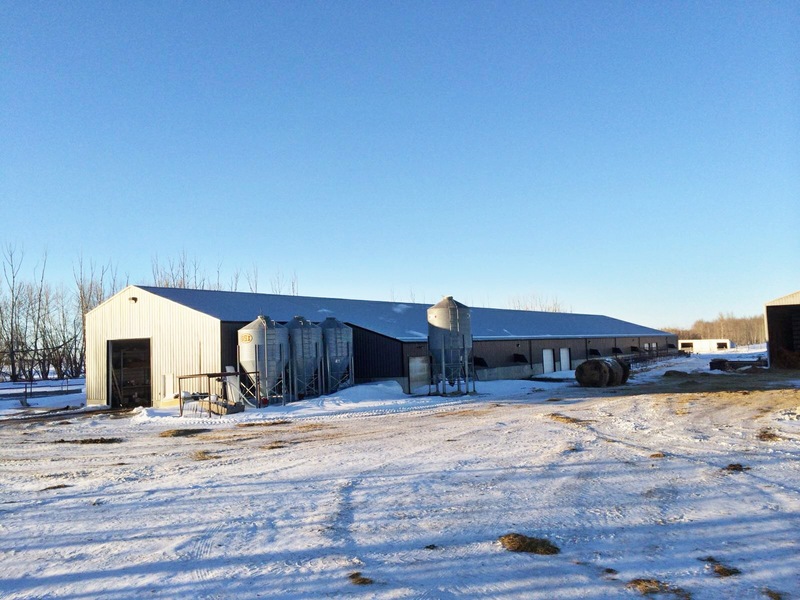 While we didn’t quite beat the snow on that last job, we are thankful to have the extra feeding space for the winter months and are glad to have the project completed. 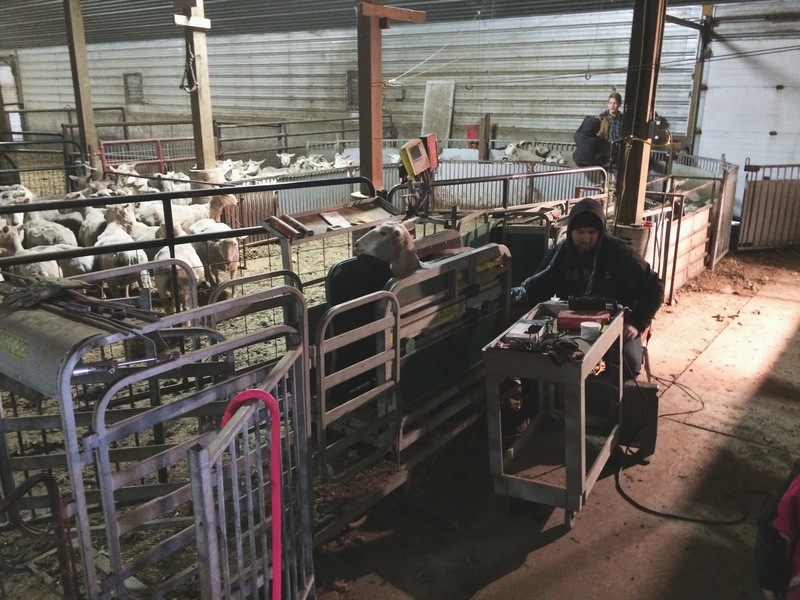 With everything outside freezing up and buried in snow, our attentions have turned inside the barn where we have a number of jobs to get accomplished before ultrasounding and shearing. Both of which will be happening over the next month and a bit. Check back soon to keep up with the countdown to our first lambing of 2014.